Zimbabweans are scared the military will not accept the result of the forthcoming elections is it does not go their way, a survey by a respected Pan African think-tank has shown. In its pre-election survey conducted by the Mass Public Opinion Institute, Afrobarometer said while opposition MDC Alliance presidential candidate Nelson Chamisa has reduced incumbent Zanu PF leader Emmerson Mnangagwa's lead to a paltry 3%, the ruling party's organisational acumen could still carry the day in its favour. "Most importantly, Zimbabweans expressed concerns about the final stages of the election and especially the role therein of the military. "Perhaps people remember earlier elections, when some security chiefs threatened to block any transfer of power to the political opposition. And they surely recall the heavy military presence in the 'coup that was not a coup' of November 2017," said the survey. Mnangagwa came to power on the back of a military coup last November that forced the then president Robert Mugabe to resign. Amid reports of military presence in the countryside, the army last month moved in to pacify restive citizens with the opposition claiming some 5000 troops had been deployed. The Afrobarometer survey said Defence Spokesperson Overson Mugwisi's assurances did little to reduce the anxiety. "In an effort to counteract popular concerns, a spokesman for the Zimbabwe Defence Forces denied on June 4 that soldiers were supervising the ruling party's campaign in the countryside and tried to assure the public that the military would limit itself to an impartial role in the election. "These appeals apparently fell on deaf ears. In both the May and July surveys, significant minorities of citizens reported that they expected that: incorrect election results would be announced: 44% in May, 45% in July, the armed forces would not respect the election result: 41% in May, 44% in July (and that) post-election violence would occur: 40% in May, 44% in July," the survey revealed. This apprehension has been attributed to the fear among at least 20% of Zimbabweans to reveal their political choices despite a drop of 6% from the May figure. Majorities expressed these concerns in the cities and towns. In sum, as the day of the vote approached, citizen apprehensions about yet another disputed election with a violent aftermath were on the rise. "But Zimbabweans continued to display high levels of self-censorship, especially when compared with an average of 70% across other African countries," the results show. 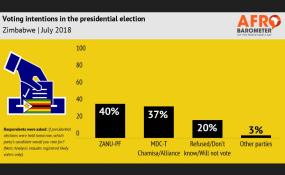 With indications showing the distinct possibility of a second round in the presidential poll, Afrobarometer however said the 20% "reticent" respondents could prove vital. "If undeclared voters split their votes in the same proportions as declared voters (i.e. 40% for the Zanu PF and 37% for the MDC), then we estimate that the incumbent candidate could win on the first round. "But what if, as seems more likely, undeclared voters lean toward the opposition? What proportion of these reticent citizens would have to vote for the MDC to ensure the opposition a majority of votes (50% plus one) on the first round? "According to our calculation, the MDC would have to obtain about two-thirds (66%) of undeclared votes in order to secure a first-round victory in the presidential election. In our opinion, this prospect lies within the realm of reasonable possibility," the investigation shows. A military backed campaign in the 2008 run-off election resulted in a bloodbath that forced then MDC-T leader Morgan Tsvangirai to pull out of the race at the eleventh hour.